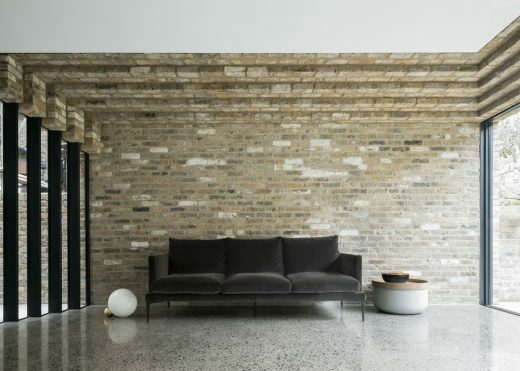 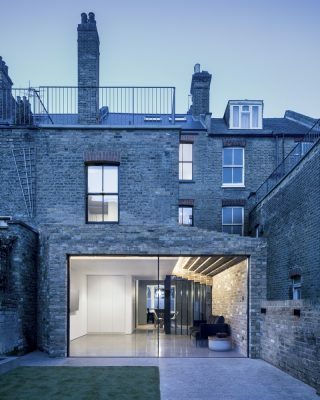 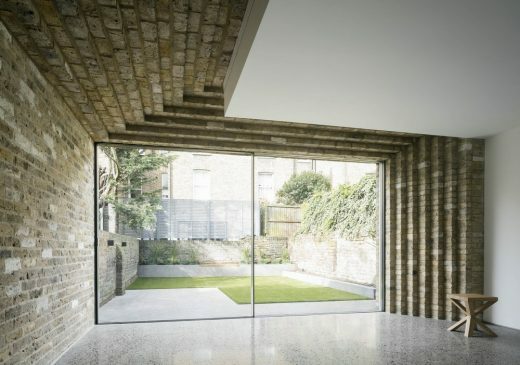 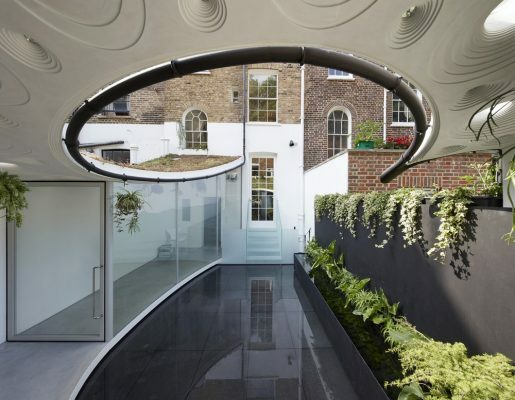 This rhythmic stepping generated by the brick is echoed throughout the interior, and is integrated in both the plan and section of the extension. 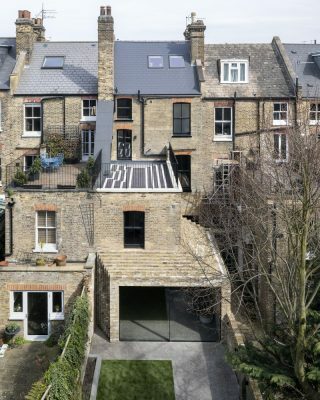 Viewed from the terrace above, the form creates an attractive silhouette – a feature rare in more straightforward additions. 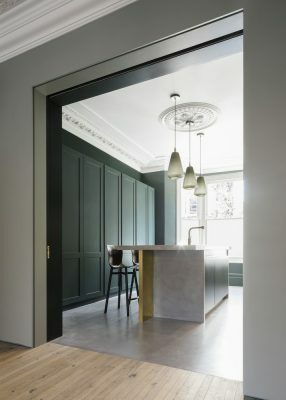 Inside, Bureau de Change’s characteristic dramatisation of space comes into play with a careful sequencing of spaces – transforming the expansive ground floor into a journey through carefully designed ambiences. 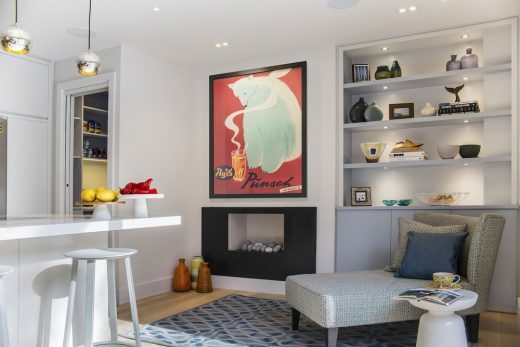 The standard layout has been flipped, with the kitchen taking its new place at the front of the house – an often underused, forgotten space. 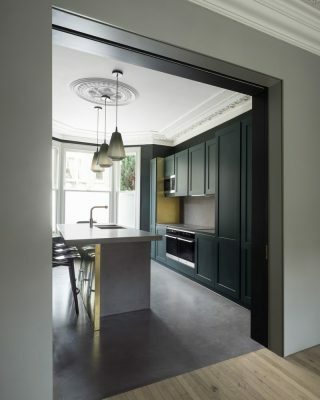 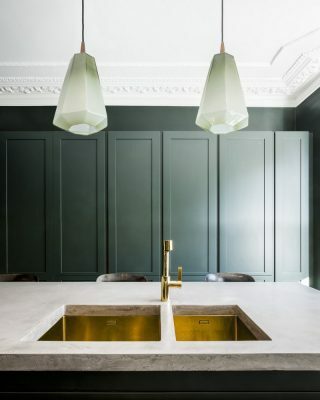 Here, the original features of the house are retained, emphasised by dark colours and material tones. 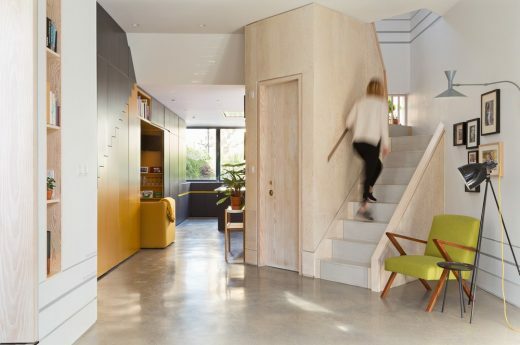 Moving onward, the spaces unfold in a sequence from dark to light – intensifying the bright, voluminous feel of the addition. 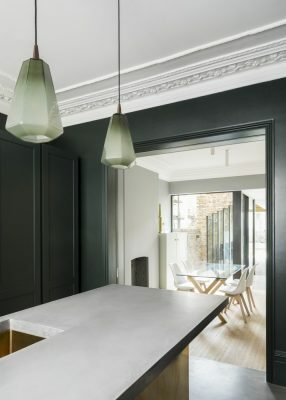 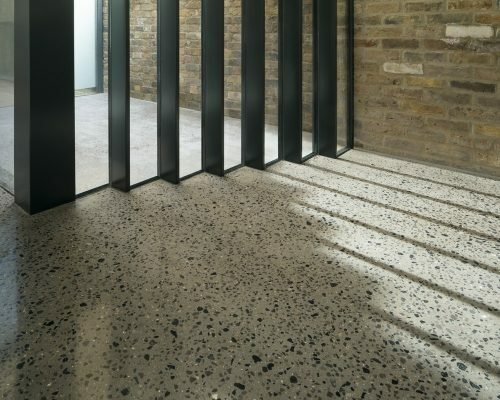 In the centre, the dining room is marked by a change in floor treatment: narrow timber planks with aligned seams transition between the smooth concrete of the kitchen and the roughlygrained concrete of the extension. 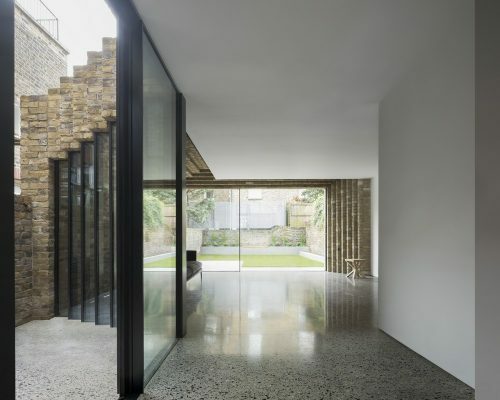 A light-well ensures the full depth of the plan is bright, and provides a moment of pause within the interior. 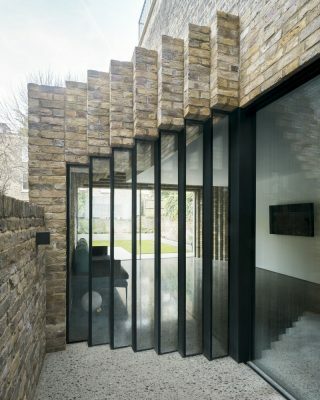 Here, where faceted glass meets stepped brick, the geometry of the concept is accentuated. 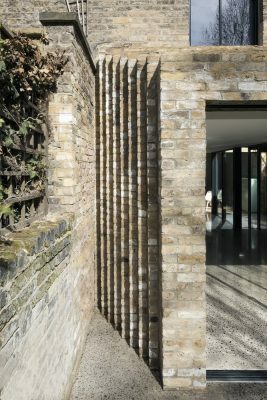 For Bureau de Change, the notion of using a common-place material, such a brick, in an unexpected way is a motif that can be seen across much of their work. 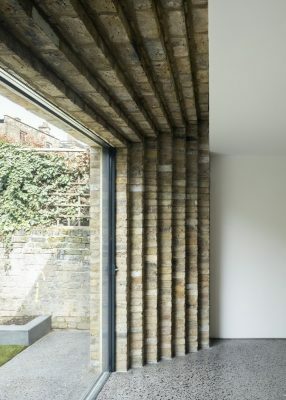 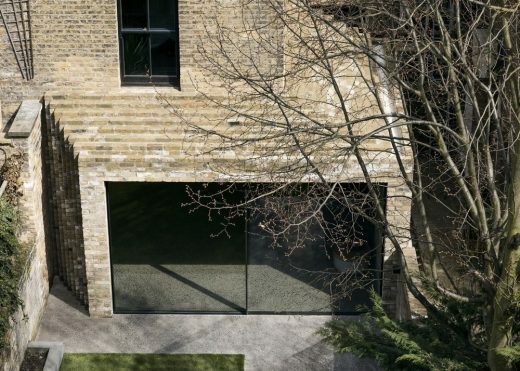 In the case of the Step House, the brick, left exposed inside and out, is celebrated in a way that respects the existing house while clearly departing from the traditional language of the historic architecture.